At 2:20 a.m. on April 15, 1912, the British ocean liner Titanic sinks into the North Atlantic Ocean about 400 miles south of Newfoundland, Canada. The massive ship, which carried 2,200 passengers and crew, had struck an iceberg two and half hours before. On April 10, the RMS Titanic, one of the largest and most luxurious ocean liners ever built, departed Southampton, England, on its maiden voyage across the Atlantic Ocean. The Titanic was designed by the Irish shipbuilder William Pirrie and built in Belfast, and was thought to be the world’s fastest ship. It spanned 883 feet from stern to bow, and its hull was divided into 16 compartments that were presumed to be watertight. Because four of these compartments could be flooded without causing a critical loss of buoyancy, the Titanic was considered unsinkable. While leaving port, the ship came within a couple of feet of the steamer New York but passed safely by, causing a general sigh of relief from the passengers massed on the Titanic‘s decks. On its first journey across the highly competitive Atlantic ferry route, the ship carried some 2,200 passengers and crew. After stopping at Cherbourg, France, and Queenstown, Ireland, to pick up some final passengers, the massive vessel set out at full speed for New York City. 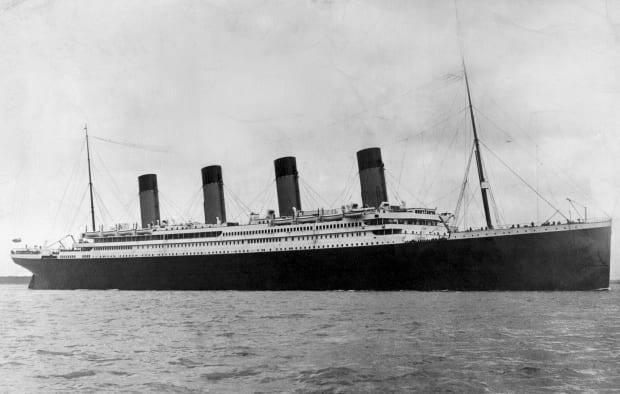 However, just before midnight on April 14, the RMS Titanic failed to divert its course from an iceberg and ruptured at least five of its hull compartments. These compartments filled with water and pulled down the bow of the ship. Because the Titanic‘s compartments were not capped at the top, water from the ruptured compartments filled each succeeding compartment, causing the bow to sink and the stern to be raised up to an almost vertical position above the water. Then the Titanic broke in half, and, at about 2:20 a.m. on April 15, stern and bow sank to the ocean floor. Because of a shortage of lifeboats and the lack of satisfactory emergency procedures, more than 1,500 people went down in the sinking ship or froze to death in the icy North Atlantic waters. Most of the 700 or so survivors were women and children. A number of notable American and British citizens died in the tragedy, including the noted British journalist William Thomas Stead and heirs to the Straus, Astor, and Guggenheim fortunes. One hour and 20 minutes after Titanic went down, the Cunard liner Carpathia arrived. The survivors in the lifeboats were brought aboard, and a handful of others were pulled out of the water. It was later discovered that the Leyland liner Californian had been less than 20 miles away at the time of the accident but had failed to hear the Titanic‘s distress signals because its radio operator was off duty. Announcement of details of the tragedy led to outrage on both sides of the Atlantic. In the disaster’s aftermath, the first International Convention for Safety of Life at Sea was held in 1913. Rules were adopted requiring that every ship have lifeboat space for each person on board, and that lifeboat drills be held. An International Ice Patrol was established to monitor icebergs in the North Atlantic shipping lanes. It was also required that ships maintain a 24-hour radio watch. On September 1, 1985, a joint U.S.-French expedition located the wreck of the Titanic lying on the ocean floor at a depth of about 13,000 feet. The ship was explored by manned and unmanned submersibles, which shed new light on the details of its sinking.